In the Summer, the warm weather often puts me off taking some time out of my day to pamper, preen and perform some of my favourite self-care activities. Lightweight oils instead of thick creams and hydrating masks to battle my skin's dehydration are just a few things that I like switch up in my pamper routine come Summer. An absolute pamper staple, whether rain or shine, is an Essie manicure. I've been torn between a true red hue, a muted mauve shade or a vivid coral, so I tend to switch them up every week or so. I tend to take more showers in the Summertime as they're great to refresh myself quickly, but that doesn't mean I don't take a bath every now and again. The new Zoella Jelly and Gelato Bath Frosting is great as the scent is uplifting and works well when the bath temperature isn't scorching hot. I like to concentrate on boosting hydration when it comes to skincare, the Clarins SOS Hydra Mask* being a new favourite of mine for when my dehydrated complexion needs to be nourished. To ensure that my under eye area remains supple and soft, I apply half a drop of The Ordinary's Caffeine Solution* before my moisturiser. The Zoella Shower Shake has been a welcomed addition into my routine as it helps to deliver a boost of hydration all over the body, whilst for the legs it doubles up as a shaving cream. Although this is great for lazy days, I like to use this in the shower before hopping out and slathering on The Body Shop Thai Makrut Lime Firming Oil*, a nourishing treatment that sinks into the skin, leaving it feeling firm, smooth and soft. I've really upped my haircare routine and during the Summer I like to make sure it's targeted towards dry ends and irritable scalp. The Philip Kingsley Coconut Breeze Elasticiser* and After-Sun Scalp Mask* are a favourite duo of mine as they replenish my dry, damaged locks which makes them feel super soft and healthy. 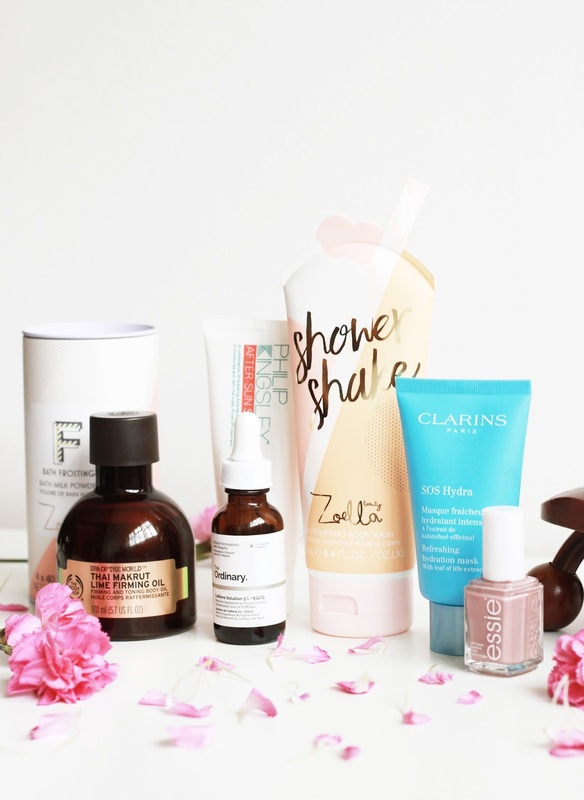 What are your top Summer pamper picks?